If you've ever been sitting in an airport or driving down the highway wondering if in the stress of getting ready for a trip you remembered to do something important before you left, then this list is for you. 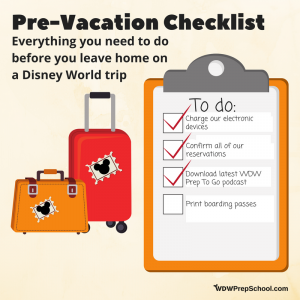 Those last couple weeks before you leave can be hectic, but we have a handy pre-vacation checklist for you that will definitely help make sure you don't forget any of the little (and not so little) things you should do before you even leave home for Walt Disney World - or any vacation! If you've checked out our Ultimate Packing List you'll know that we try our best to think of everything you could possibly ever want or need on a Walt Disney World vacation. Seriously. We cover it all. You'll also notice we tell you up-front that we do not expect you to pack everything we have on it (and considering we've had people tell us they tried and it required 4 giant bags and a caravan of pack mules to get it to Orlando, it's seriously not advised). We know that list is long, but we include everything under the sun so that you can customize it to fit your family's needs. The same holds true for this pre-travel checklist. Not everything on this list will apply to you, so please don't feel like you have to do it all. Instead, pick out the things that do apply and work your way through those. 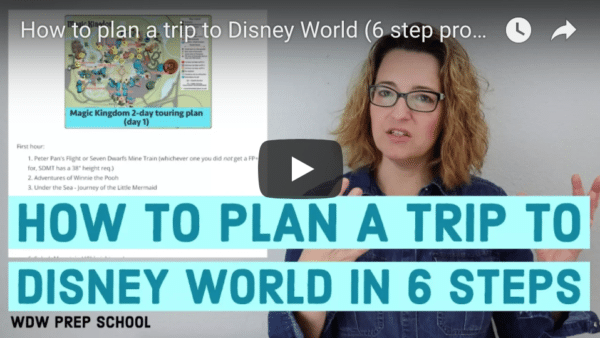 And, like our Ultimate Packing List, we have found this checklist to be helpful whenever and wherever we travel, not just when we are going to Disney World. Trust us: it is a lot easier to relax and enjoy your vacation when you can be confident that everything is in order before you go! Looking for printable versions? You'll find those at the end of the post. If flying, find the best flights for your trip by starting to check flight prices and options. Set up alerts so you'll know the best time to book. Arrange transportation to the airport. Driving to the airport and parking? Check to see if you can reserve your spot ahead of time. Some offsite parking locations even offer a discount if you pre-book it. Except for the list below, in nearly every case, you can easily replace anything you forget to pack. It may cost you some money, but you could replace most things if you needed to. These items, however, can be difficult or time consuming to replace when traveling. I hope you don’t need it…but just in case you have to cancel your trip, or you have an accident there etc.